Sir Ronald Aylmer Fisher, Fellow of the Royal Society (FRS) (February 17, 1890 – July 29, 1962) was a British statistician, evolutionary biologist, and geneticist. He was described by Anders Hald (1998) as "a genius who almost single-handedly created the foundations for modern statistical science" and Richard Dawkins (1995) described him as "the greatest of Darwin's successors." 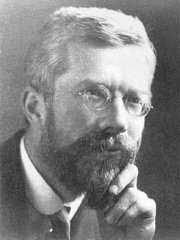 Contrary to the popular conception of an either-or dichotomy between evolution and belief in God—either evolutionary theory is correct or belief in God is correct—Ronald Fisher successfully juxtaposed the two viewpoints (Orr 1999). Fisher was a deeply devout Anglican and a leader in evolutionary theory. Orr (1999) finds it surprising that so few evolutionists seem to know that many of the brightest stars of evolutionary biology, such as Fisher and Theodosius Dobzhansky, were ardent believers in God—almost as if an "unconscious censorship" is going on because the facts are "a bit too embarrassing." Fisher was born in East Finchley, London to George and Katie Fisher. His father was a successful fine arts dealer. He had three older sisters and an older brother. His mother died when Fisher was 14. His father lost his business in several ill-considered transactions only 18 months later (Box 1978). Although Fisher had very poor eyesight, he was a precocious student, winning the Neeld Medal (a competitive essay in mathematics) at Harrow School at the age of 16. Because of his poor eyesight, he was tutored in mathematics without the aid of paper and pen, which developed his ability to visualize problems in geometrical terms, as opposed to using algebraic manipulations. He was legendary in being able to produce mathematical results without setting down the intermediate steps. Fisher also developed a strong interest in biology and, especially, evolution. In 1909, Fisher won a scholarship to Gonville and Caius College, Cambridge. There he formed many friendships and became enthralled with the heady intellectual atmosphere. At Cambridge, Fisher learned of the newly rediscovered theory of Mendelian genetics; he saw biometry—and its growing corpus of statistical methods—as a potential way to reconcile the discontinuous nature of Mendelian inheritance with continuous variation and gradual evolution. However, Fisher's foremost concern was eugenics, which he saw as a pressing social as well as scientific issue that encompassed both genetics and statistics. In 1911, he was involved in forming the Cambridge University Eugenics Society with such luminaries as John Maynard Keynes, R. C. Punnett, and Horace Darwin (Charles Darwin's son). The group was active and held monthly meetings, often featuring addresses by leaders of mainstream eugenics organizations, such as the Eugenics Education Society of London, founded by Francis Galton in 1909 (Box 1978). After graduating in 1913, Fisher was eager to join the army in anticipation of Great Britain's entry into World War I; however, he failed the medical examinations (repeatedly) because of his eyesight. Over the next six years, he worked as a statistician for the City of London. For his war work, he took up teaching physics and mathematics at a series of public schools, including Bradfield College in Berkshire, as well as aboard H.M. Training Ship Worcester. Major Leonard Darwin (another of Charles Darwin's sons) and an unconventional and vivacious friend he called Gudruna were almost his only contacts with his Cambridge circle. They sustained him through this difficult period. A bright spot in his life was that Gudruna matched him to her younger sister Ruth Eileen Gratton Guinness. The father of Ruth Eileen and Gudruna, Dr. Henry Gratton Guinness, had died when they were young and Ruth Eileen, only 16 years of age, knew that her mother would not approve of her marrying so young. As a result, Fisher married Ruth Eileen at a secret wedding ceremony without her mother's knowledge, on April 26, 1917, only days after Ruth Eileen's 17th birthday. They set up a subsistence farming operation on the Bradfield estate, where they had a large garden and raised animals, learning to make do on very little. They lived through the war without ever using their food coupons (Box 1978). Fisher and Rush Eileen were to have two sons and seven daughters, one of whom died in infancy. His daughter Joan married George E. P. Box and wrote a well-received biography of her father. During this period of the war, Fisher started writing book reviews for the Eugenic Review and gradually increased his interest in genetics and statistical work. He volunteered to undertake all such reviews for the journal, and was hired to a part-time position by Major Darwin. He published several articles on biometry during this period, including the ground-breaking "The Correlation between Relatives on the Supposition of Mendelian Inheritance," written in 1916 and published in 1918. This paper laid the foundation for what came to be known as biometrical genetics, and introduced the very important methodology of the analysis of variance, which was a considerable advance over the correlation methods used previously. The paper showed very convincingly that the inheritance of traits measurable by real values, the values of continuous variables, is consistent with Mendelian principles (Box 1978). At the end of the war, Fisher went looking for a new job and was offered one at the famed Galton Laboratory by Karl Pearson. Because he saw the developing rivalry with Pearson as a professional obstacle, however, he accepted instead a temporary job as a statistician with a small agricultural station in the country in 1919, the Rothamsted Experimental Station. Stained glass window in the dining hall of Caius College, in Cambridge, commemorating Ronald Fisher and representing a Latin square. The Rothamsted Experimental Station is now one of the oldest agricultural research institutions in the world. In 1919, Fisher started work at this station, which was (and is) located at Harpenden in Hertfordshire, England. Here he started a major study of the extensive collections of data recorded over many years. This resulted in a series of reports under the general title Studies in Crop Variation. Fisher was in his prime and he began a period of amazing productivity. Over the next seven years, he pioneered the principles of the design of experiments and elaborated his studies of "analysis of variance." He furthered his studies of the statistics of small samples. Perhaps even more important, he began his systematic approach of the analysis of real data as the springboard for the development of new statistical methods. He began to pay particular attention to the labor involved in the necessary computations, and developed ingenious methods that were as practical as they were founded in rigor. In 1925, this work culminated in the publication of his first book, Statistical Methods for Research Workers (Box 1978). This went into many editions and translations in later years, and became a standard reference work for scientists in many disciplines. In 1935, this was followed by The Design of Experiments, which also became a standard. In addition to "analysis of variance," Fisher invented the technique of maximum likelihood and originated the concepts of sufficiency, ancillarity, Fisher's linear discriminator, and Fisher information. His 1924 article "On a distribution yielding the error functions of several well known statistics" presented Karl Pearson's chi-squared and Student's t in the same framework as the Gaussian distribution, and his own "analysis of variance" distribution z (more commonly used today in the form of the F distribution). These contributions made him a major figure in twentieth-century statistics. In defending the use of the z distribution when the data were not Gaussian, Fisher developed the "randomization test." According to biographers Yates and Mather (1963), "Fisher introduced the randomization test, comparing the value of t or z actually obtained with the distribution of the t or z values when all possible random arrangements were imposed on the experimental data.” However, Fisher wrote that randomization tests were "in no sense put forward to supersede the common and expeditious tests based on the Gaussian theory of errors." Fisher thus effectively began the field of non-parametric statistics, even though he did not believe it was a necessary move. His work on the theory of population genetics also made him one of the three great figures of that field, together with Sewall Wright and J. B. S. Haldane, and as such was one of the founders of the modern evolutionary synthesis (neo-Darwinism). In addition to founding modern quantitative genetics with his 1918 paper, Fisher was the first to use diffusion equations to attempt to calculate the distribution of gene frequencies among populations. He pioneered the estimation of genetic linkage and gene frequencies by maximum likelihood methods, and wrote early papers on the wave of advance of advantageous genes and on clines of gene frequency. His 1950 paper on gene frequency clines is notable as first application of computers to biology. Fisher introduced the concept of Fisher information in 1925, some years before Claude E. Shannon's notions of information and entropy. Fisher information has been the subject of renewed interest in the last few years, both due to the growth of Bayesian inference in artificial intelligence, and due to B. Roy Frieden's book Physics from Fisher Information, which attempts to derive the laws of physics from a Fisherian starting point. An ardent promoter of eugenics, this subject stimulated and guided much of Fisher's work in human genetics. His book The Genetical Theory of Natural Selection was started in 1928 and published in 1930. It contained a summary of what was already known in the literature. Fisher developed ideas on sexual selection, mimicry, and the evolution of dominance. He famously showed that the probability of a mutation increasing the fitness of an organism decreases proportionately with the magnitude of the mutation. He also proved that larger populations carry more variation so that they have a larger chance of survival. He set forth the foundations of what was to become known as population genetics. About a third of the book concerned the applications of these ideas to humans and summarized the data available at the time. Fisher presented a theory that attributed the decline and fall of civilizations to the arrival of a state where the fertility of the upper classes is forced down. Using the census data of 1911 for England, he showed that there was an inverse relationship between fertility and social class. This was partly due, he believed, to the rise in social status of families who were not capable of producing many children but who rose because of the financial advantage of having a small number of children. Therefore, he proposed the abolishment of the economic advantage of small families by instituting subsidies (he called them allowances) to families with larger numbers of children, with the allowances proportional to the earnings of the father. He himself had two sons and six daughters. According to Yates and Mather (1963), "His large family, in particular, reared in conditions of great financial stringency, was a personal expression of his genetic and evolutionary convictions." The book was reviewed, among others, by physicist Charles Galton Darwin, a grandson of Charles Darwin, and following publication of his review, C. G. Darwin sent Fisher his copy of the book, with notes in the margin. The marginal notes became the food for a correspondence running at least three years (Fisher 1999). Between 1929 and 1934, the Eugenics Society also campaigned hard for a law permitting sterilization on eugenic grounds. They believed that it should be entirely voluntary and a right, rather than compulsory or a punishment. They published a draft of a proposed bill, and it was submitted to Parliament. Although it was defeated by a 2:1 ratio, this was viewed as progress, and the campaign continued. Fisher played a major role in this movement, and served in several official committees to promote it. As an adult, Fisher was noted for his loyalty to his friends. Once he had formed a favorable opinion of any man, he was loyal to a fault. A similar sense of loyalty bound him to his culture. He was a patriot, a member of the Church of England, politically conservative, and a scientific rationalist. Much sought after as a brilliant conversationalist and dinner companion, he very early on developed a reputation for carelessness in his dress and, sometimes, his manners. In later years, he was the archetype of the absent-minded professor. The custom of making abstract dogmatic assertions is not, certainly, derived from the teaching of Jesus, but has been a widespread weakness among religious teachers in subsequent centuries. I do not think that the word for the Christian virtue of faith should be prostituted to mean the credulous acceptance of all such piously intended assertions. Much self-deception in the young believer is needed to convince himself that he knows that of which in reality he knows himself to be ignorant. That surely is hypocrisy, against which we have been most conspicuously warned. It was Fisher who referred to the growth rate r (used in equations such as the logistic function) as the Malthusian parameter, as a criticism of the writings of Thomas Robert Malthus. Fisher referred to "…a relic of creationist philosophy…" in observing the fecundity of nature and deducing (as Darwin did) that this therefore drove natural selection. He received the recognition of his peers in 1929 when he was inducted into the Royal Society. His fame grew and he began to travel more and lecture to wider circles. In 1931, he spent six weeks at the Statistical Laboratory at Iowa State College in Ames, Iowa. He gave three lectures a week on his work, and met many of the active American statisticians, including George W. Snedecor. He returned again for another visit in 1936. In 1933, Fisher left Rothamsted to become a professor of eugenics at University College London. In 1937, he visited the Indian Statistical Institute (in Calcutta), which at the time consisted of one part-time employee, Professor P. C. Mahalanobis. He revisited there often in later years, encouraging its development. He was the guest of honor at its 25th anniversary in 1957, when it had grown to 2,000 employees. In 1939, when World War II broke out, University College London tried to dissolve the eugenics department, and ordered all of the animals destroyed. Fisher fought back, but he was then exiled back to Rothamsted with a much-reduced staff and resources. He was unable to find any suitable war work, and though he kept very busy with various small projects, he became discouraged of any real progress. His marriage disintegrated. His oldest son, a pilot, was killed in the war. In 1943, Fisher was offered the Balfour Chair of Genetics at Cambridge University, his alma mater. During the war, this department was also pretty much destroyed, but the university promised him that he would be charged with rebuilding it after the war. He accepted the offer, but the promises were largely unfilled, and the department grew very slowly. A notable exception was the recruitment in 1948 of the Italian researcher Cavalli-Sforza, who established a one-man unit of bacterial genetics. Fisher continued his work on mouse chromosome mapping and other projects. They culminated in the publication in 1949 of The Theory of Inbreeding. In 1947, Fisher co-founded with Cyril Darlington the journal Heredity: An International Journal of Genetics. Fisher eventually received many awards for his work and was dubbed a Knight Bachelor by Queen Elizabeth II in 1952. Fisher was opposed to the conclusions of Richard Doll that smoking caused lung cancer. Yates and Mather (1963) conclude: "It has been suggested that the fact that Fisher was employed as consultant by the tobacco firms in this controversy casts doubt on the value of his arguments. This is to misjudge the man. He was not above accepting financial reward for his labours, but the reason for his interest was undoubtedly his dislike and mistrust of puritanical tendencies of all kinds; and perhaps also the personal solace he had always found in tobacco." After retiring from Cambridge University in 1957, Fisher spent some time as a senior research fellow at the CSIRO in Adelaide, Australia. He died of colon cancer there in 1962. Fisher's important contributions to both genetics and statistics are emphasized by the remark of L. J. Savage, "I occasionally meet geneticists who ask me whether it is true that the great geneticist R. A. Fisher was also an important statistician" (Aldrich 2007). Fisher, R. A. 1915. Frequency distribution of the values of the correlation coefficient in samples from an indefinitely large population. Biometrika 10: 507–521. Fisher, R. A. 1918. The correlation between relatives on the supposition of Mendelian inheritance. Trans. Roy. Soc. Edinb. 52: 399–433. It was in this paper that the word variance was first introduced into probability theory and statistics. Fisher, R. A. 1922. On the mathematical foundations of theoretical statistics. Philosophical Transactions of the Royal Society, A 222: 309–368. Fisher, R. A. 1922. On the dominance ratio. Proc. Roy. Soc. Edinb. 42: 321–341. Fisher, R. A. 1924. On a distribution yielding the error functions of several well known statistics. Proc. Int. Cong. Math. 2: 805–813. Fisher, R. A. 1925. Theory of statistical estimation. Proceedings of the Cambridge Philosophical Society 22: 700–725. Fisher, R. A. 1925. Applications of Student's distribution. Metron 5: 90–104. Fisher, R. A. 1926. The arrangement of field experiments. J. Min. Agric. G. Br. 33: 503–513. Fisher, R. A. 1928. The general sampling distribution of the multiple correlation coefficient. Proceedings of Royal Society, A 121: 654–673. Fisher, R. A. 1934. Two new properties of mathematical likelihood. Proceedings of Royal Society, A 144: 285–307. Fisher, R. A. 1925. Statistical Methods for Research Workers. Edinburgh: Oliver and Boyd. ISBN 0050021702. Fisher, R. A. 1930. The Genetical Theory of Natural Selection. Oxford: Clarendon Press. ISBN 0198504403. Fisher, R. A. 1935. The Design of Experiments. Edinburgh; London: Oliver and Boyd. Fisher, R. A. 1949. The Theory of Inbreeding. New York: Academic Press. Fisher, R. A. 1950. Contributions to Mathematical Statistics. John Wiley. Fisher, R. A. 1956. Statistical Methods and Statistical Inference. New York: Hafner Press. ISBN 0028447409. Fisher, R. A., with F. Yates. 1938. Statistical Tables for Biological, Agricultural and Medical Research. London: Oliver and Boyd. Aldrich, J. 1997. R. A. Fisher and the making of maximum likelihood 1912–1922. Statistical Science 12(3): 162–176. Retrieved May 17, 2007. Aldrich, J. 2007. A guide to R. A. Fisher. University of Southampton. Retrieved May 17, 2007. Box, J. F. 1978. R. A. Fisher: The Life of a Scientist. New York: Wiley. ISBN 0471093009. Dawkins, R. 1995. River out of Eden: A Darwinian View of Life. New York: Basic Books. ISBN 0465016065. Fisher, R. A. 1999. The Genetical Theory of Natural Selection. Oxford University Press. ISBN 0198504403. Hald, A. 1998. A History of Mathematical Statistics from 1750 to 1930. New York: Wiley. ISBN 0471179124. Howie, D. 2002. Interpreting Probability: Controversies and Developments in the Early Twentieth Century. Cambridge University Press. ISBN 0521812518. Orr, H. A. 1999. Gould on God: Can religion and science be happily reconciled? Boston Review October/November. Retrieved May 17, 2007. Salsburg, D. 2002. The Lady Tasting Tea: How Statistics Revolutionized Science in the Twentieth Century. New York: W.H. Freeman. ISBN 0805071342. Yates, F., and K. Mather. 1963. Ronald Aylmer Fisher. Biographical Memoirs of Fellows of the Royal Society of London 9: 91–120. This page was last modified on 30 July 2011, at 01:24.